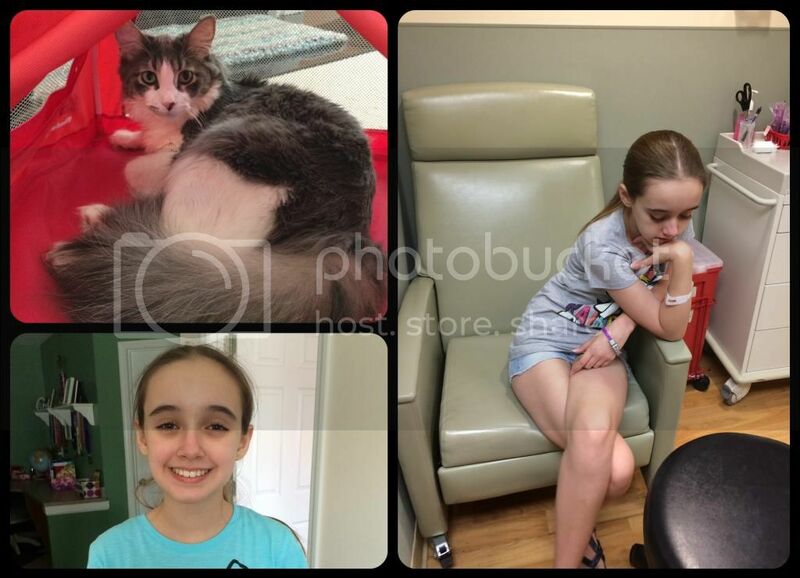 This has been a busy, crazy, and fun last week of our official summer break. Amber is entirely exhausted and will probably be sick most of the weekend, but she had a great week and acted like a normal kid. We didn't make any progress with her medical tests this week. After many hours and going to three different labs on Monday, each making calls to the doctor's office, we gave up. Nobody seems to know how to actually do the blood draw the neuroscience doctor requested. They don't even have to do the analysis, just the draw. The test itself is only done at the Mayo Clinic. At this point we may have to road trip to Mayo for a blood draw (I'm only half joking.. we really need this test). The doctor has been on vacation this week so we are waiting for info on how to do the blood draw. Even the neuroscience lab didn't know how to draw it. I had a few moments after the whole debacle on Monday where I thought I would have a complete melt down. Apparently, I'm not dealing well with this new diagnosis. And here I thought I was so together. Let's not even mention that Amber hasn't started her supine exercise regimen yet because I can't get her new heart rate monitor to work so I just threw it back in the box and hid it from my sight. (TOP-LEFT) Milori at home in an American Girl doll tent. He was so adorable. (RIGHT) Lab #3 - even had an admittance bracelet. Still no lab work. (BOTTOM-LEFT) After a day of fun with the homeschool group. She crashed immediately after the picture. Other than the medical issues, it's been all fun this week. 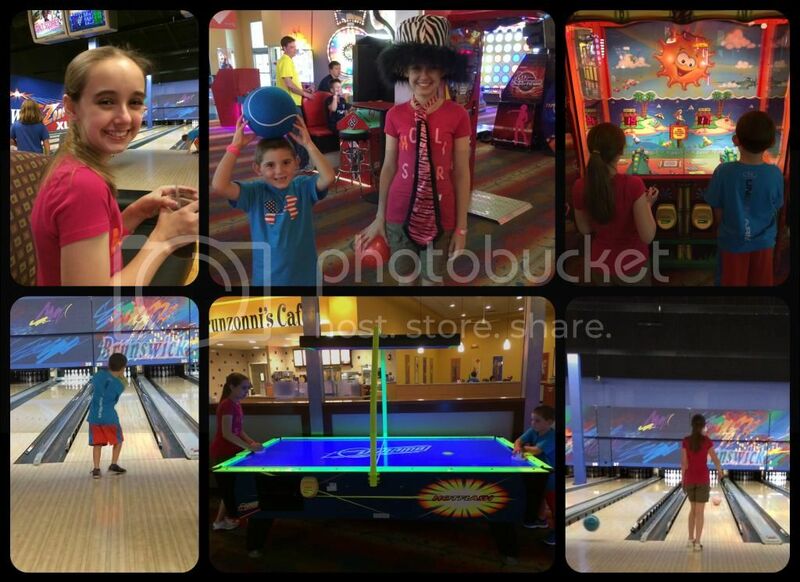 We had a homeschool teen group outing to Brunswick Zone on Tuesday and the kids had a blast. They played laser tag, bowled, goofed off and even played some arcade games. It was exhausting for Amber, but she recovered by the next morning. Wednesday my nephew came for his summer visit and is actually still here until tomorrow morning. We started with an afternoon of birthday shopping for the newly 7 year old Spencer and some video game playing before dinner. 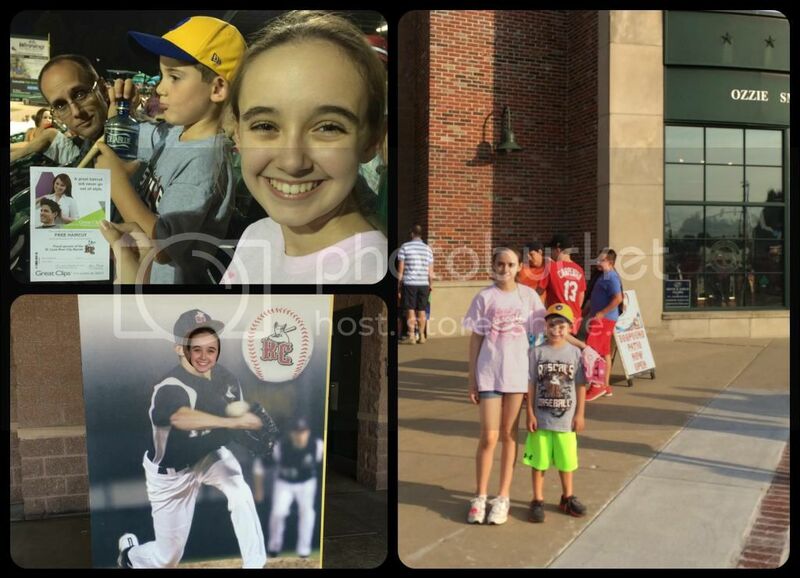 Wednesday evening we took the kids to see our local Frontier league baseball team play. The ball park is only 10-15 minutes from our house and Spencer loves baseball. Amber had never been to a baseball game in her life, so this was a new experience for her. The weather is still unbelievably perfect here which made it quite an enjoyable night, even if the local team was creamed. Thursday was the second anniversary of my daddy's death and we always spend that day with my mom. We started with a little time for my mom to visit Dad. I always find this terribly difficult and so just stand off a bit aloof. It seems so crazy that my dad is reduced to a name, dates, and a few words on a headstone. I know it's the normal way of life, but it does not reconcile in my mind that the headstone is all there is to him now. I can still hear his voice as clearly as if he was next to me. (TOP-LEFT) Amber won a free haircut just for being in the randomly drawn seat. She was so thrilled to have won and have the mascot come see her. (RIGHT) Both kids wearing their Rascal's t-shirts purchased just for the game. 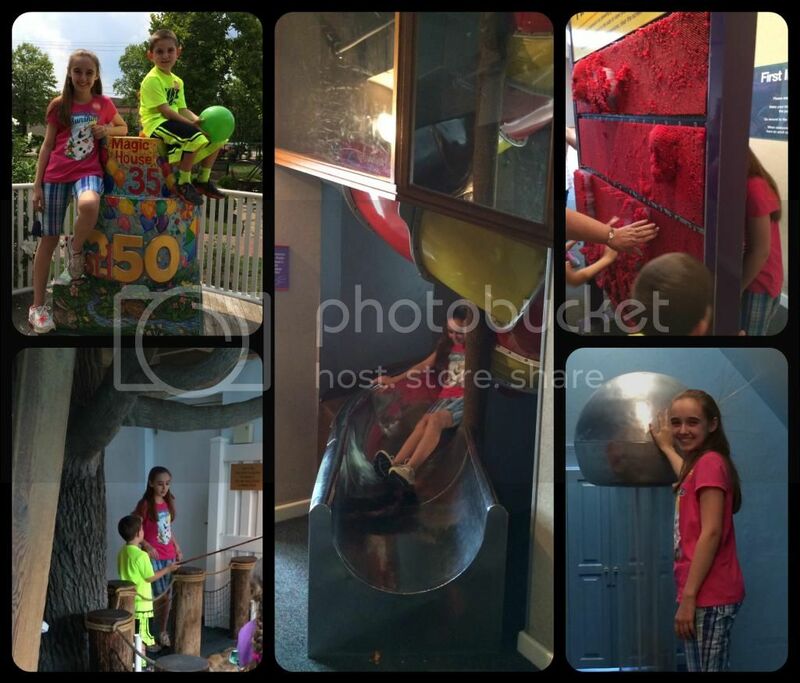 We also took the kids to the St. Louis Magic House for a loud and fun afternoon. The kids had a great time, but the adults were struck by the total rudeness of most children. I was very pleased to see my daughter and nephew wait their turns, yield to others, help younger children, and be generally polite. I think their favorite part was the detective area where they searched for clues, found secret passages in a bookshelf and fireplace, climbed through the "ducts" of the house in the detective area, and watched the adults through one way mirrors. Today we were back at Brunswick Zone so that Amber and Spencer could do everything we just did on Tuesday. Amber is definitely running out of umph for the week, but she's trying to be a good big cousin and not a wet blanket. Tomorrow is more family time to properly celebrate Spencer's birthday with everyone. Then Sunday is Fred's and my 18th wedding anniversary. I'm not sure how it's been that long, but the math says the number is correct. We don't have big plans, but I know that Fred and Amber desperately want to see Guardians of the Galaxy, so I'm sure that will figure in our Sunday plans. We are still starting the new school year on Monday, but only half days this week. Amber will undoubtedly be tired on Monday still and we have several activities planned next week. The homeschool teen group is swimming indoors one day and Amber plans to join them. She's also getting together with her friend that is leaving soon for a long vacation. We have to start Amber's prescribed safe exercises next week as well. Half days will make it easier to figure out how we incorporate that into our life - assuming I figure out the heart rate monitor. Our school days this week will mainly consist of the new history setup, literature, German, and writing. I have been so stressed that Amber still has not quite finished Saxon Algebra 1/2 because of all the sick days. Then I finally realized that somewhere I lost a year in my school planning count. Amber will start Algebra 1 in a month or so - that's 7th grade. Algebra 2 in 8th grade. We plan to do Saxon Advanced math (which includes geometry) over 2 years, as recommended by Art Reed, in 9th and 10th grade. That only leaves Calculus left for 11th grade. Hmm. Somehow I thought we had calculus lined up for 12th grade. I'm so relieved. Amber still has a whole buffer year to allow for sick days. We will probably never start a new level in August again, but that's ok. I'll figure out how to record it on transcripts when it's time. We also aren't starting science until September because Amber already completed 1/3 of Earth Science and Astronomy in 6th grade. Even starting in September, science should still finish before May. There's no rush this year and we will be switching curriculum next year, so this is our year to take a leisurely tour of science. I'm trying very hard to stick to all the plans for a relaxed and flexible school schedule this year. Having a diagnosis for POTS and the probable autoimmune disease doesn't change much in regards to school at this point, but does makes me grateful that I had already realized that Amber could not keep up the old schedule. I would have a lot of planning work to correct otherwise. However, the diagnosis helps me mentally justify allowing such a relaxed school plan. This is a huge benefit alone. Good luck and happy first day to anyone who is starting school next week as well! I am excited to read about all the other first days coming up this next month or so. What a blast of a week. I hope you are able to find a place that can do the blood draw without a lot of travel. Please know that we continue to keep all of you in our prayers. Thanks Dawn. We continue to pray for your family as well. I hope all was good this week. Phew, you have a lot to deal with at the moment. I'll be praying and I'm sure given time it will become your new normal and you will handle it all with ease. Just give yourself some time! Wow you guys did do a lot! Just from this post it sounds like you have a little trooper on your hands despite all she has to deal with physically, and she is beautiful. God bless you and your family! Happy Homeschooling! I'm glad you were able to fit in a lot of fun with your nephew and other activities. I must have missed something though. What is going on with the monitor and exercises? The blood testing issue and delay justifies a meltdown n my opinion! You did well composing yourself! I hope and pray that the lab figures out how to do it this week. It's Amber's therapy for POTS. Which we might not be starting now until another test is completed to be sure and not skew the test results. The therapy is supposed to help her with symptoms. It won't fix anything, just helps her feel better. As always we are praying for your family. Hopefully that blood draw will get done this week and give you some answers. The rest of the week sounds like a lot of fun although I am sure tiring for Amber. We will be seeing Guardians of the Galaxy on Wednesday through my wife's work. I can wait it should be a blast. Also I left a msg last week that I think ended up in your spam filter. Isn't she a beautiful girl? Despite everything she is going through, she always has a smile on...and is a trooper! Look at all you did! I'm tired! LOL Sounds like her schooling is going just awesome!